Alan Palestine, MD, Brad H. Feldman, M.D., Hubert H. Pham, MD MS, Maria A. Woodward, MD and Vinay A. Shah M.D. Onchocerciasis ICD-9 125.3. This article focuses on the ophthalmic consequences of this systemic disease. Onchocerciasis (“African River Blindness”) is a filarial infection caused by the nematode Onchocerca volvulus—one of the nine worldwide filarial nematodes in which humans are the definitive host. Of the three subtypes associated with filarial infection (lymphatic, subcutaneous, and visceral), onchocerciasis falls into the subcutaneous category, as one of its main presenting features are subcutaneous nodules. These nodules are followed in turn by ocular manifestations that, if left untreated, can lead to blindness. Onchocerca volvulus breed exclusively in the Simulium yahense black fly, found only in certain endemic areas near fast-flowing rivers and streams. The life cycle starts by a black fly biting an infected human host and ingesting microfilariae from the skin or blood. These microfilariae migrate from the gut to the thoracic flight muscles of the fly, where they develop from the initial larval phase into the infective microfilariae after one week (Stages J1 --> J2). They then migrate to the salivary glands of the fly and are ready to be transmitted again (Stage J3s). The third stage larvae are then introduced into the skin of the new human host via a fly bite, where over the next 6-12 months, they develop into mature adult parasites. The larger female nematode migrates to the subcutaenous or deeper fascial tissues and becomes encapsulated by a fibrous shell. The males migrate into these capsules in order to fertilize the females. It is these capsules that are the characteristic subcutaenous nodules of onchocerciasis. Fertilized adult females in these nodules produce millions of microfilariae, which are responsible for the systemic and ocular findings of onchocerciasis. While the most common mode of transmission is direct via insect bites, the disease can also be spread transplacentally from an infected mother to her fetus. Exposure to the Simulium yahense black fly in endemic areas. The associated iridocyclitis is thought to result from this inflammatory response, which in turn can lead to cataract formation. Similarly, the glaucoma associated with onchocerciasis is often thought to be due to synechiae formation as a secondary form of angle closure glaucoma. However, onchocerciasis has been found to be an independent risk factor in glaucoma even in those without synechiae formation. Light microscopy studies have shown affected individuals to have normal trabecular anatomy, but abnormal post-trabecular anatomy affecting the more downstream outflow system. This is thought to be a factor in the increased prevalence of glaucoma in endemic areas despite the lack of synechiae formation in affected individuals. Global preventative efforts are currently concentrated in population-based prophylactic treatment through programs such as the African Programme for Onchocerciasis Control (APOC). Community-wide ivermectin administration (Mectizan®, donated by Merck) and vector (black fly) control have been the mainstay of these programs, which have been markedly successful. These measures have resulted in an estimated 35 million people no longer being at risk for infection, two million infected people who have been appropriately treated, and over 200,000 people in whom blindness has been prevented.However, in some highly endemic areas, more than three decades of annual treatment are still needed in order to effectively control this preventable disease. Individual prevention can include protective measures to avoid contact with the black flies in endemic areas, including avoiding areas in which the disease is systemic, using insect repellent and wearing appropriate clothing. Diagnosis is made clinically with confirmation by superficial skin snip biopsies. Newer adjuvant tests including PCR amplification and serology have largely supplanted the historical Mazzotti test (see below, “Medical Treatment”). These ocular findings are most often accompanied by cutaneous findings, warranting a full dermatologic exam. These can include freely mobile subcutaneous nodules measuring 0.5 – 3.0 cm in diameter most often palpable over bony prominences (especially over the hips and lower limbs or head). These nodules present concurrently with the development of diffuse papular dermatitis, orange-peel textured skin, linchenified dermatitis, atrophy, fine wrinkles, lymphadenitis ("hanging groin"), and eventually depigmentation (“leopard skin”). Typically, dermatologic manifestations are the initial presenting symptoms. Ophthalmic signs often present several years afterwards. The severity of these ocular symptoms depends on the duration of infection and the microfilarial load, as well as the strain of microfilaria that is infecting the host. Slit lamp examination can be diagnostic or suggestive of the disease. Visualizing nematodes in the anterior chamber can demonstrate the presence of a parasitic infection. However, typically nematodes are not visualized, and the classic corneal, anterior chamber, and chorioretinal lesions in the setting of an appropriate history and antecedent skin findings can lead to the correct diagnosis. Confirmation of suspected onchocerciasis involves a bloodless skin snip where specimens are taken from areas of apparently involved skin, as well as from the scapula, over each iliac crest and each calf. These specimens are then incubated for up to 24 hours in normal saline and a stain is applied in order to identify the species of the motile elements seen in the specimens (O. volvulus have no sheath or nuclei in their tails, differentiating them from other nematodes). This test is very specific but not sensitive for those with lower worm burdens, early in their infection. It is more valuable 18+ months post-infection for the worms to be abundant, large and mature enough to be detected. Serology can also be used to detect exposure to O. volvulus with high sensitivity and specificity. Newer ELISA and Western Blot techniques have been used to quantitatively detect antibodies to O. volvulus antigens in the skin, tears, and urine. Other assays detect levels of antibody subclass IgG4 for diagnosis.PCR, ultrasound of the nodules, and sclerocorneal biopsy have also been suggested as other tests to help confirm the diagnosis. Proposed tests that are currently being investigated include the diethylcarbamazine (DEC) skin patch test, the antibody card test, and the antigen detection test. However, these tests are not currently available for clinical use and are not commonly available in endemic areas. More antiquated methods include using the Mazzotti test, in which DEC (diethylcarbamazine) is given to individuals who are thought to be infected, leading to systemic reactions including rashes, fevers, generalized body pains, uveitis, and possible anaphylaxis. The presence of these findings were highly suggestive of onchocerciasis (as well as other filarial infections), and the killed microfilariae could sometimes be found in the blood or urine. However, due to the severity of the reactions, it is no longer used clinically. The differential diagnosis of the dermatologic findings, in isolation from the ophthalmic findings, is extensive. The diffuse papular dermatitis may be due to food allergies, syphilis, leprosy, vitamin A deficiency, and yaws. The differential diagnosis for subcutaneous nodules is also extensive, and can include: multiple types of tumors (mesenchymal, metastatic, etc. ), skin appendage lesions, inflammatory or infectious lesions, or other tumor-like lesions or cysts. Traditionally, DEC (diethylcarbamazine) was given to kill the microfilariae, leading to the systemic side effects of the Mazzotti test (see Diagnosis, above). However, this drug was phased out of use by the development of newer antihelminthics without the same spectrum of systemic side effects. The standard treatment of onchocerciasis now utilizes the broad-spectrum antiparasitic ivermectin, given as a single dose and repeated every 6-12 months over a course of around 10 years. Ivermectin decreases the microfilarial load by paralyzing the microfilariae over a six-month period. It has no effect on the adult nematodes, however. Monotherapy with ivermectin (150µg/kg) has been shown to mitigate the development of optic atrophy when treatment is started early in the course of the disease.Moreover, ivermectin has been shown to reduce the visual field loss associated with onchocerciasis years after treatment, as well as the severity of keratitis. However, more advanced chorioretinal and keratitis lesions, and secondary glaucoma are not treated by ivermectin. Acute complications that result from the infection can be treated symptomatically—e.g. any iridocyclitis can be treated with topical corticosteroids or cycloplegic medications. Antibiotic trials using 6-week-long courses of doxycycline against the endosymbiont, Wolbachia have shown decreased microfilarial loads in adults. Moreover, it was found that treating the worms with doxycycline prior to the death of the host nematode reduced the numbers of Wolbachia and resulted in a decrease in post-treatment corneal thickness and stromal haze in an animal model. It can also suppress reproduction of the adult nematodes and production of microfilariae for up to 18 months. However, trials are lacking on shorter durations of treatment. Recent literature has suggested the appearance of strains of filarial nematodes similar to O. volvulus and strains of O. volvulus that are resistant to ivermectin. Therefore, other treatments have been tried with varying levels of success include rifampin, rifampicin, and azithromycin. Further study is needed to investigate alternative therapies for the treatment of onchocerciasis. Patients suspected to have onchocerciasis should be referred to an infectious disease specialist familiar with the management of this mostly sub-Saharan tropical disease. Those undergoing treatment for any ophthalmic complications should be followed frequently, at least every 3-6 months initially, to ensure adequate control of any ongoing inflammation or other complications that may arise. However, no standardized protocol exists and follow-up should be scheduled at the discretion of the treating physician. Surgical interventions can be directed at the underlying etiology of vision loss. Cataract extraction can be performed on visually significant cataracts induced by the disease process. Trabeculectomy or other filtering procedures can be performed as needed for secondary glaucoma. Corneal pathology can potentially be treated with penetrating keratoplasty (PKP), and chorioretinal lesions may be treated by vitrectomies or laser photocoagulation as indicated. There is no established protocol for surgical follow-up of onchocerciasis patients. Follow-up should be determined by the treating physician and be based on the clinical picture and type of procedure performed. The ocular sequelae are manifold. As mentioned before, the infection can lead to corneal opacification (sclerosing keratitis), secondary angle closure and open angle glaucoma, cataracts, chorioretinitis, and optic atrophy. Combined, these manifestations lead to the blindness that gives the disease its name. Prognosis depends on the stage at which the infection is treated. If treated early during the course of the disease, the corneal opacities may be minimal and may recede with appropriate treatment. However, as the disease progresses, the visual outcomes can progress towards blindness and may be irreversible. In a global sense, studies have found a direct relationship between O. volvulus microfilarial load and early host mortality.Other studies have shown significant socioeconomic and public health effects of the disease. Overall, this is a devastating disease with a multitude of ramifications that bears a poor prognosis for the villages and the residents of these villages that are afflicted by this terrible disease. However, it should be noted that major strides have been made through the combined efforts of public and private sector partnerships, involving such organizations as the Carter Center, Hellen Keller International, Lions Clubs International, Onchocercasis Control Programme (OCP), and African Programme for Onchocerciasis Control (APOC), in conjuction with local health ministries. As a result of this work, it was recently announced that parts of Uganda and Sudan have broken the cycle of transmission of onchocerciasis. The progress made in these previously endemic areas serves as an inspiration for countries in which the burden of disease is great and challenges the preconception that this is a disease that will forever afflict these disadvantaged persons. Pham HH, Harrison DA. Onchocerciasis (African River Blindness). American Academy of Ophthalmology. EyeSmart® Eye health. https://www.aao.org/eye-health/diseases/onchocerciasis-african-river-blindness. Accessed March 20, 2019. American Academy of Ophthalmology. Uveitis: Other infectious uveitis: onchocerciasis Practicing Ophthalmologists Learning System, 2017 - 2019 San Francisco: American Academy of Ophthalmology, 2017. ↑ 4.0 4.1 4.2 4.3 4.4 Richards, F.O., Boatin, B., Sauerbrey, M. & Sékétéli, A. Control of onchocerciasis today: status and challenges. Trends Parasit 17, 558-63 (2001). ↑ 5.0 5.1 5.2 5.3 WHO Expert Comittee on Onchocerciasis Control Onchocerciasis and its Control. (Geneva, 1995). ↑ Basañez, M.-G. et al. River blindness: a success story under threat? PLoS medicine 3, e371 (2006). ↑ 7.0 7.1 7.2 7.3 Cupp, E.W., Sauerbrey, M. & Richards, F. Elimination of human onchocerciasis: history of progress and current feasibility using ivermectin (Mectizan(®)) monotherapy. Acta tropica 120 Suppl, S100-8 (2011). ↑ 12.0 12.1 12.2 Duerr, H.P., Raddatz, G. & Eichner, M. Control of onchocerciasis in Africa: threshold shifts, breakpoints and rules for elimination. Int J Parasit 41, 581-9 (2011). ↑ 13.0 13.1 Little, M.P., Breitling, L.P., Basáñez, M.-G., Alley, E.S. & Boatin, B. a Association between microfilarial load and excess mortality in onchocerciasis: an epidemiological study. Lancet 363, 1514-21 (2004). ↑ 14.0 14.1 Kirkwood, B., Smith, P., Marshall, T. & Prost, A. Relationships between mortality, visual acuity and microfilarial load in the area of the Onchocerciasis Control Programme. Trans R Soc Trop Med Hyg 77, 862-8 (1983). ↑ 15.0 15.1 Prost, A. & Vaugelade, J. Excess mortality among blind persons in the West African savannah zone. (Article in French). Bull World Health Organ 59, 773-6 (1981). ↑ 16.0 16.1 Prost, A. The burden of blindness in adult males in the savanna villages of West Africa exposed to onchocerciasis. Trans Ophthalmol Soc United Kingdom 80, 525-7 (1986). ↑ Berger, R.B., Blackwell, N.M., Lass, J.H., Diaconu, E. & Pearlman, E. IL-4 and IL-13 regulation of ICAM-1 expression and eosinophil recruitment in Onchocerca volvulus keratitis. Inv Ophthalmol Vis Sci 43, 2992-7 (2002). ↑ Cross, H.F., Haarbrink, M., Egerton, G., Yazdanbakhsh, M. & Taylor, M.J. Severe reactions to filarial chemotherapy and release of Wolbachia endosymbionts into blood. Lancet 358, 1873-5 (2001). ↑ 20.0 20.1 Keiser, P.B. et al. Bacterial endosymbionts of Onchocerca volvulus in the pathogenesis of posttreatment reactions. J Infect Dis 185, 805-11 (2002). ↑ 21.0 21.1 Higazi, T.B. et al. Wolbachia endosymbiont levels in severe and mild strains of Onchocerca volvulus. Mol Biochem Parasit 141, 109-12 (2005). ↑ 22.0 22.1 Hoerauf, A. et al. Depletion of wolbachia endobacteria in Onchocerca volvulus by doxycycline and microfilaridermia after ivermectin treatment For personal use . Only reproduce with permission from The Lancet Publishing Group . Lancet 357, 415-1416 (2001). ↑ Zimmerman, P.A. et al. Onchocerca volvulus DNA probe classification correlates with epidemiologic patterns of blindness. J Infect Dis 165, 964-8 (1992). ↑ Erttmann, K.D., Meredith, S.E., Greene, B.M. & Unnasch, T.R. Isolation and characterization of form specific DNA sequences of O. volvulus. Acta Leidensia 59, 253-60 (1990). ↑ 25.0 25.1 25.2 Meredith, S.E., Lando, G., Gbakima, A.A., Zimmerman, P.A. & Unnasch, T.R. Onchocerca volvulus: application of the polymerase chain reaction to identification and strain differentiation of the parasite. Exp Parasit 73, 335-44 (1991). ↑ 26.0 26.1 Egbert, P.R., Jacobson, D.W., Fiadoyor, S., Dadzie, P. & Ellingson, K.D. Onchocerciasis: a potential risk factor for glaucoma. Br J Ophthalmol 89, 796-8 (2005). ↑ Semba, R.D. et al. Longitudinal study of lesions of the posterior segment in onchocerciasis. Ophthalmology 97, 1334-41 (1990). ↑ Chippaux, J.P. et al. Effect of repeated ivermectin treatments on ocular onchocerciasis: evaluation after six to eight doses. Ophthal Epid 6, 229-46 (1999). ↑ Neumann, E. & Gunders, A.E. Pathogenesis of the posterior segment lesion of ocular onchocerciasis. Am J Ophthalmol 75, 82-9 (1973). ↑ Anderson, J., Fuglsang, H., Marshall, T.F. & Al., E. Studies on onchocerciasis in the United Cameroon Republic. IV. A four-year follow-up of six rain-forest and six savanna villages. The incidence of ocular lesions. Trans R Soc Trop Med Hyg 2, 513-5 (1978). ↑ 31.0 31.1 Murphy, R.P., Taylor, H. & Greene, B.M. 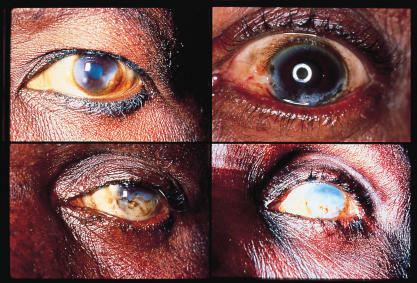 Chorioretinal damage in onchocerciasis. Am J Ophthalmol 98, 519-21 (1984). ↑ Braun, G., McKechnie, N.M., Connor, V. & Al., E. Immunological crossreactivity between a cloned antigen of Onchocerca volvulus and a component of the retinal pigment epithelium. J Exp Med 174, 169-77 (1991). ↑ McKechnie, N.M., Gürr, W., Yamada, H., Copland, D. & Braun, G. Antigenic mimicry: Onchocerca volvulus antigen-specific T cells and ocular inflammation. Inv Ophthalmol Vis Sci 43, 411-8 (2002). ↑ 34.0 34.1 34.2 34.3 34.4 Freedman, D.O. Onchocerciasis. Tropical Infectious Diseases: Principles, Pathogens and Practice 1176-88 (2005). ↑ Weil, G.J., Lammie, P.J. & Weiss, N. The ICT Filariasis Test: A rapid-format antigen test for diagnosis of bancroftian filariasis. Parasit Today 13, 401-4 (1997). ↑ Weil, G.J. et al. A rapid-format antibody card test for diagnosis of onchocerciasis. J Infect Dis 182, 1796-9 (2000). ↑ Stingl, P., Ross, M., Gibson, D.W., Ribas, J. & Connor, D.H. A diagnostic “patch test” for onchocerciasis using topical diethylcarbamazine. Trans R Soc Trop Med Hyg 78, 254-8 (1984). ↑ Beaman, F.D. et al. Superficial soft-tissue masses: analysis, diagnosis, and differential considerations. Radiographics : a review publication of the Radiological Society of North America, Inc 27, 509-23 (2007). ↑ Albiez, E.J., Büttner, D.W. & Duke, B.O. Diagnosis and extirpation of nodules in human onchocerciasis. Trop Med Parasit (German) 39 Suppl 4, 331-46 (1988). ↑ Udall, D.N. Recent updates on onchocerciasis: diagnosis and treatment. Clin Infect Dis 44, 53-60 (2007). ↑ Coles, G.C., Rhodes, A.C. & Wolstenholme, A.J. Rapid selection for ivermectin resistance in Haemonchus contortus. Vet Parasitol 129, 345-7 (2005). ↑ Vickers, M., Venning, M., McKenna, P.B. & Mariadass, B. Resistance to macrocyclic lactone anthelmintics by Haemonchus contortus and Ostertagia circumcincta in sheep in New Zealand. New Zealand Vet J 49, 101-5 (2001). ↑ 44.0 44.1 Specht, S. et al. Efficacy of 2- and 4-week rifampicin treatment on the Wolbachia of Onchocerca volvulus. Parasi Res 103, 1303-9 (2008). ↑ Osei-Atweneboana, M.Y. et al. Phenotypic evidence of emerging ivermectin resistance in Onchocerca volvulus. PLoS Negl Trop Dis 5, e998 (2011). ↑ Osei-Atweneboana, M.Y., Eng, J.K.L., Boakye, D. a, Gyapong, J.O. & Prichard, R.K. Prevalence and intensity of Onchocerca volvulus infection and efficacy of ivermectin in endemic communities in Ghana: a two-phase epidemiological study. Lancet 369, 2021-9 (2007). ↑ Hoerauf, A. et al. Effects of 6-week azithromycin treatment on the Wolbachia endobacteria of Onchocerca volvulus. Parasit Res 103, 279-86 (2008). This page was last modified on March 20, 2019, at 17:15.